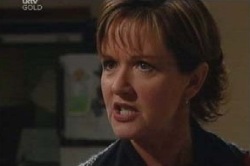 Karl tells Susan that she has no right to tell him how he feels. She hasn't lost a child. Susan admits that he's right, and apologises, but points out that he is doing exactly the same thing that he did with their marriage. Karl denies it, but Susan argues that it is: he's backing away and hiding from the truth, getting drunk to try to solve his problems. She calls him a coward and reminds him that Izzy needs the father of her child by her side, not "some half drunk shadow incapable of feeling anything but his own selfish needs". Sky and Lana look at their published "Enigma and Freak Girl" comic. Sky is thinking they should branch out, make more cartoon series and pitch them to other magazines, make merchandise, everything. Lana isn't very enthusiastic about the whole thing and eventually tells Sky that she can't continue the series: her dad has been offered a job in Canada, so she has to move back. Connor and Carmella are kissing on the couch. Connor pulls away and Carmella asks if she's doing something wrong. Connor goes into the age old "it's not you, it's me" routine. He admits that he is anxious about meeting Carmella's mother, after meeting Rocco and all. Carmella assures him that her mother is nothing like her father. She approves of their relationship. CONNOR: She's not just saying that to your face? She's not just saying that, and meanwhile she's got her seven protective Italian brothers tracking me down? CARMELLA: She doesn't have seven protective brothers. She tells Connor she doesn't want to sneak around like last time, and assures him that he'll like her mother. Susan has made Karl a cup of tea, and comments that it's a bit late in the day for the hospital to discharge Izzy. Karl tells her she didn't want to stay until the morning. Susan offers to give him a lift, but Karl has called for a taxi. He thanks Susan, who tells him she's just being a friend. She says she's sorry for the loss, but neither can say much more, because the taxi has pulled up and honked its horn. Susan offers to tidy up, then she'll let herself out. 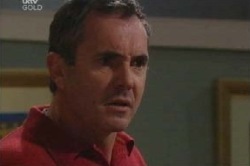 Connor tells Lou about Carmella's desire for him to meet her mother. Lou laughs and says, "nice knowing you". Connor tells him she's not like Rocco. Lou doesn't believe him, because of who she was married to. Lou asks if this is Carmella's first serious relationship. Connor tells him it is. "Then yes, you are dead." Karl returns with Izzy. After declining his offer of a drink, she suddenly says that she hates hospitals and doesn't know how Karl can work there. Karl laughs and tells her he got used to it. Karl tries to mention memorial service arrangements, but as soon as Izzy picks up on it, she decides she wants a drink of lemonade and goes into the kitchen. Any attempt Karl makes to bring it up, Izzy interrupts and changes the subject. Lana tells Sky about her father's plans to move back to Canada. Sky can't believe how calm she's being. Lana admits that it's driving her crazy, but she doesn't have a choice about it. Her father even knows how well she's fitting in. Sky tells her that she's starting to feel that the two of them are soul mates, and Lana agrees. She says that Sky helped her come out, and she'll never forget her for that. They agree that they'll make the most of the six weeks they have left. Izzy and Karl sit on the couch and watch TV. Suddenly Izzy jumps up and suggests that they go out. Carmella, her mother Lucia and Connor sit at a table. Lou leaves them to it. Connor is very nervous and apologises for before. Carmella wants to know what he's apologising about. Lucia tells her it's nothing, and says that Connor was the perfect gentleman, not even knowing who she was. Suddenly Carmella realises she left her phone in the Coffee Shop and leaves to get it. Lucia uses the opportunity to ask Connor how responsible he is. Connor tells her he is very responsible. Then suddenly, she changes her tune again, cheerfully offering Connor a job. They agree to discuss the details later. Connor is overjoyed, and tells her it means a lot for him and his daughter. Lucia is taken aback. She had no idea. Lana and Sky walk into the complex. Sky has no idea what Lana is planning. Lana tells her to open the backpack she has. In it Sky finds a shovel, a torch and a balaclava. In Lana's backpack are some stakes (“Let me guess: this is some Sunnydale moment? You're really a teenage vampire, right?”) and a mysterious bag of something. When Lucia and Carmella have a minute alone, Carmella asks her what she thinks of Connor. Lucia tells her he seems really sweet, but wants to know why Carmella neglected to tell her about Connor's daughter. Carmella tells her she didn't want her to make up her mind about him before meeting him. Lucia tells her that she'll always come second to Maddy. Carmella tells her that Connor isn't like that. Before either of them can say any more, Connor returns. Izzy and Karl enter the pub. Lou apologises for their loss, then slips up by adding that he hopes they get pregnant again soon and put it all behind them. After an awkward pause, Lou goes off behind the bar. Karl tells Izzy that Lou didn't mean to say the wrong thing, people just don't know what to say. He tells her they'll get through it. Izzy says that she's dealt with it, it's time to move on. Karl goes to the bar to get some drinks. Lou immediately apologises. Karl tells him not to worry about it. Meanwhile, Susan has come in and goes over to Izzy. She offers her condolences and tells her that if there's anything she or Karl need, not to hesitate to ask. Izzy thanks her. Connor, Carmella and Lucia have finished the night with coffees. Connor apologises for only having instant. Lucia jokes that Italians judge people by their coffee, but what would the Irish know about coffee? She says her goodbyes and leaves Carmella and Connor alone. Connor is pleased that Lucia likes him, and mentions that the job will give him money for himself and Maddy. He tells her that she'll just love Maddy as soon as she meets her. Carmella says she's sure she will, but looks lost in thought. In bed, Izzy lies facing away from Karl. Karl tells her that she doesn't have to pick up and move on straight away. They both need to give themselves time. Izzy doesn't answer and pretends to be asleep. Sky and Lana, having spent the night outside, wake up and admire their handiwork. Taking Lana completely by surprise, Sky kisses her.